This amazing look is from Peach’s Up to Barre fall collection. There I was, enjoying brunch on a gorgeous Saturday in Boston with four of my BFFs. The conversation flowed from topic to topic as it always does. That is, until we landed on Peach and what it’s really like to work at a fashion startup. With their inner fashionistas out in full force, I could not answer their questions fast enough. Several days later, I found myself reflecting on our conversation. It was fun, it was energizing and my friends’ passion for the topic was palpable. With the upcoming fall launch of our new Up to Barre athleisure collection just around the corner, it felt like the perfect opportunity to share the highlights. 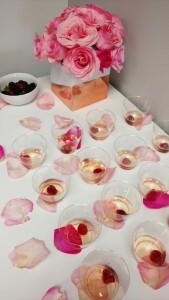 Peach works with top models and stylists from New York and Boston. Let’s be honest – haven’t we all wondered at one time or another what it’s like behind the scenes at a women’s fashion company? This was definitely true for me before I jumped into the world of marketing at Peach. While there are certainly glamorous moments, the day-to-day at a fashion startup is filled with so much more, including creativity, innovation, collaboration, laughter (yup, you read that right! ), and good old hard work. With this in mind, I’m excited to share a peek into the world of launching a women’s apparel collection from start to finish. Daniela builds a wall of design inspiration for each collection. The fashion design process at an apparel company is all about turning a vision into a reality. First, the design team collects inspiration and decides on a color story for the collection; from there, they select fabrics from around the world and sketch out silhouettes. The next step is creating “tech packs” (think: specifications about measurements, materials, etc.). Once the samples are created, a fit model is selected and the team conducts multiple fittings with her (fun fact: a fit model is chosen for her measurements, rather than her appearance!). After that, wear testing is performed (Personally, I love this part of the process. Lucky volunteers get to keep the samples!). While it’s a ton of hard work, it is so rewarding bringing our vision to life. If you happen to stop by our home office early one morning or late one evening, you might run into Daniela Bascuñan, our Fashion Design Director, working with her mood boards or sketching her next collection. Manufacturing women’s apparel is inherently a global process. As an early-stage fashion startup, it’s important for us to be very hands-on with our factory partners around the world. We look for ways to build personal relationships and to keep the momentum moving forward, despite being continents apart. 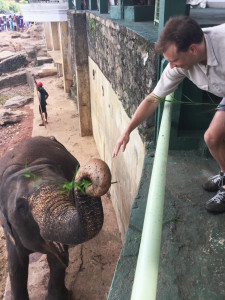 Peach Co-Founder Derek Ohly meets a baby elephant in Sri Lanka! For our design, product and inventory team, travel is a must. While it may not always be glamorous, it is always exciting to travel to places they might not otherwise visit (knocking off a few bucket list experiences – like visiting an elephant sanctuary – in the process!). As a result of their personal relationships with the men and women at our apparel factories, they get to experience these fascinating places and cultures in ways tourists can’t even imagine. This is one of my favorite parts to launching a women’s athleisure line! The product is no longer just an idea; it’s a reality. Now, the work to bring it to life through images, copy and visual design begins. In short, this is where the brand story gets told. Our photographer shoots the Sylvie dress from the fall collection. First, there is the photo shoot. At Peach, we are lucky enough to work with some of the best creative talent in Boston and New York to deliver on our vision – photographers, art directors, wardrobe stylists, and models. Even though I have led many shoots, I learn something new each time! Have you ever found yourself flipping through Vogue or Elle, admiring a campaign, and wondering if modeling is as easy as the gorgeous image suggests? With first-hand experience working with models at a fashion company, I can honestly tell you that it’s so much more than a beautiful face. It has everything to do with the practiced art of movement and expression to capture the emotion of a collection campaign. By this point in the process, our graphic designers, marketing and sales teams are chomping at the bit for the photo shoot images. Creativity is at its peak as these teams go to work to bring the new collection to the market by creating the website design, social media imagery, catalogs, sales materials, and training tools. Peach differentiates itself from other women’s athleisure companies with our direct sales model. Our national network of stylists tells the brand story and brings the products directly to clients at trunk shows and in-home parties. The stylists create an exciting shopping experience that is not possible in traditional stores and online. Trunk shows are a fun way to shop and be with friends! Think about this for a hot minute. If you are a Peach client, you benefit from a super convenient shopping experience that is fun, personal and social (who doesn’t like to shop with their BFFs while holding a glass of bubbly?). For the busy woman, our direct sales model is a game-changing time-saver. So there you have it, the conversation highlights from an afternoon spent with great company, sipping champagne and noshing on yummy brunch goodies. To learn more about Peach, check us out on our website. If you would like to be-in-the-know for the launch of our new collections (I promise Up to Barre will not disappoint! ), don’t forget to sign up for our emails and connect with us on Facebook and Instagram. Would you like to have your own fashion business? Consider becoming a Peach stylist.